There are few things in life that are better than a great burger. OK, maybe there are more than a few, but it really can't be all that many. This is especially true when you top the burger with a slice of cheddar, some grilled onions (as in actually on the grill), and some tangy BBQ sauce. We're talkin' about some serious USDA grade-A all-American fire-grilled good eats! Put the beef, BBQ seasoning, soy sauce and water in a large mixing bowl. 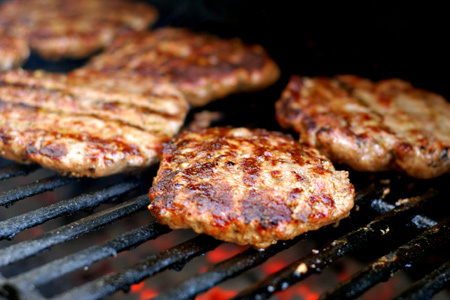 Divide the meat into six equal portions and form them into evenly-sized patties 1/2" thick patties (about six inches in diameter). Season both sides of each onion slice lightly with salt and pepper, being careful to leave the rings intact. 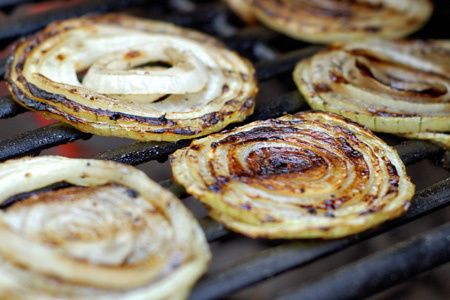 Move the burgers to the cooler side of the grill and top each with a slice of cheese and a grilled onion slice. 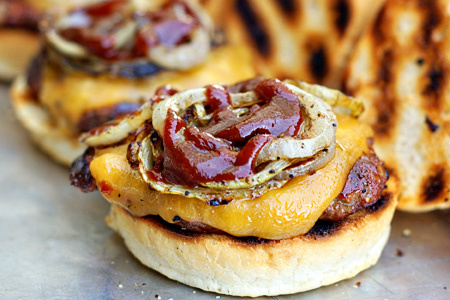 Top each burger with a healthy drizzle of barbecue sauce. Hey John, you forgot to put BBQ sauce on mine! 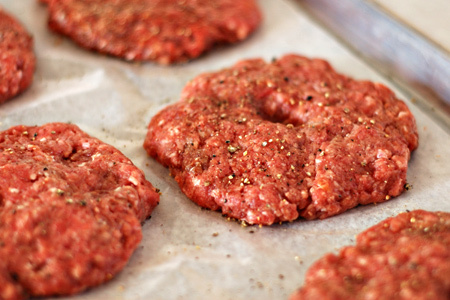 Great, simple recipe for a classic burger. I've never heard of the ice cold water in the mix. What's that do for the meat? These look great! I am adding them to this week's menu. Thanks, Patio Daddio! The water is a trick that I learned from Adam Perry Lang. It really helps keep the burgers super moist. I'm not a fan of onions, but I'll take the rest! These burgers look AMAZING! Tell me about poking a hole in the burger. Curious! Just ate one of the best burgers to come off our grill. It was amazing and I don't usually like burgers. Thanks for a great recipe! My burgers cook so much better since I learned the finger poke technique. Might have picked it up from you on the forum, can't remember, but they stay nice and burger shaped. They used to ball up like a hockey puck when they cooked. I like the hamburge you have on the computer i going to try to make them for my family when i get a chance. You ca use a shot glass in the center of the meat I pick this years ago from a recipe on the net. 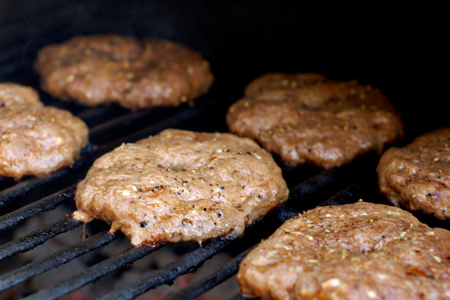 great burgers even greater are the onions, "I love Onions" you spiced them up a little with your favorite chili Sauce. I replaced the onions with Bacon. Not a fan of onions but a huge fan of bacon. Burgers tasted great. Thank for the recipe. Made the burger mix for these today (left off the onions & BBQ this time, for the picky people) for Mother's Day lunch at our house. Everyone raved about the flavor & the tenderness of the meat. Thanks for a go-to burger recipe!